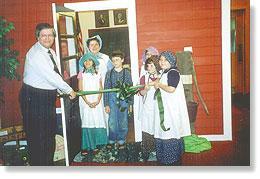 In 2002 the Board of Directors of the Dodge County Historical Society approved the development of a one-room schoolhouse display for the museum. A local antique collector had a collection of student desks and slate chalkboards. He was willing to donate them to the museum if a display could be developed. The Board considered several options and settled on a storage room on the third level. It had been an office when the building was the Williams Free Library, housing childrens books. A design was approved that included plank floors, shelving for memorabilia, and a bell tower. A door was relocated and a window installed. 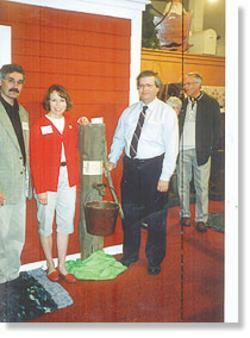 Frames were constructed for the slate boards and a period wood stove was purchased and installed. Although smaller than most one-room schoolhouses, it contains desks, flags, presidential portraits and appropriate books, establishing an authentic setting. Moreover, the museum already had many items form actual schools that had been donated in the past. These included games, pictures, uniforms, workbooks, inkwells and hand bells. 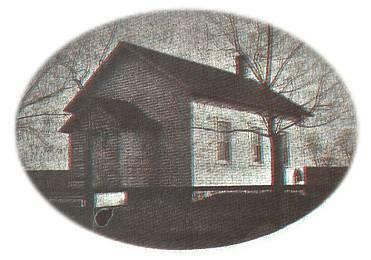 When the community became aware of the project many individuals donated class picture of their own school. This display has become one of the most popular with young people as they study Wisconsin history. 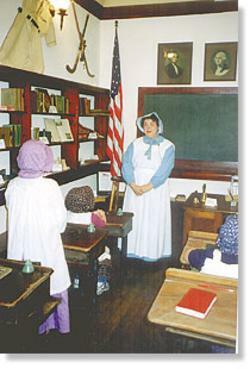 Area elementary students frequently visit the display and experience firsthand what school life in the last 1800's and early 1900's were like, while adult visitors reminisce about their childhood experiences in the one-room schoolhouse.